Heya, I got some free time and I'm feeling adventurous so I'll livestream my coding and other antics. Just click that link, enter your nick, hit enter and wait a little. I have no idea if I can post in here or not, but why didn't you post this in the Mari0 section? This is about Mari0, and I had no idea this was happening, I hardly ever go in here. This was a global announcement, visible everywhere. It'll be made like that again once livestream is active. I'll just bump this since it's relevant again. I'm surprised no one is on irc right now. 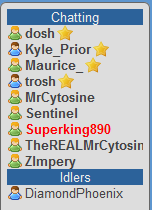 Pyr0saur wrote: I'm surprised no one is on irc right now. I gotta do this next time. ^ what did you expect when the word CODING is in the title?